Everything has its ritualized aspects... every season (Le Sacre du Printemps for instance by Stravinsky), religion (baptismal, betrothal, & burial rites) or even the quotidian (the morning cup of coffee, checking the newspaper/tablet, & brushing the teeth). All deal with the practical passages of production -- whether theatrical or manufacturing -- that take on a rhythmic, almost hypnotic, pulse in which the extraordinary becomes very ordinary & habit-forming (Ritual de lo Habitual to use Jane's Addiction). People nowadays take chocolate for granted, just like a bloated chicken in every pot & two cars in every garage. Largely ignored in the frenzy to consume it is how chocolate derives from a tree, requires manifold incremental steps, each as important as the next in the processing chain, & once served as the sacrament of a bygone civilization. This label, called Ritual, tries to reach back & rekindle that ancient spirit by standard seed selection, traditional processing methods, & the now-conventional marketing cues -- all pretty routine in the new era chocolate craft movement to right (homonym intended) the slights & wrongs of mass produced candy. 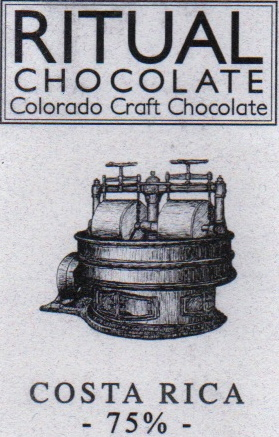 Heir to 3rd generation pioneer & mystery-man Steve De Vries, the Thomas Pynchon / John Malkovich of chocolate, who built his studio in Denver, CO. Ritual now leases the space & uses his equipment. It likewise follows in his footsteps to source this inaugural bar from Costa Rica. Unlike the early De Vries Costa Ricans that were heavily soaked in balsamic & brined olives (basically vinegar for the wine 'n cheese society), or even Escazú's spiced-laden Guapiles from the same property (& probably harvest), this comes much different. Thanks, in part, to a spare formulation of cocoa mass & sugar & nothing else. Yes, there's a nod to the balsamic & herbal spice. But the persistent berry tone runs virtually the whole length. It holds this bar together which hovers precariously on the verge of downside Brut(ish). So much so that except for the dark hue of that fruit, its innate sweetness almost qualifies it for Semi-Dark, despite only the 25% sugar content in this bar. Technicalities notwithstanding (chalk element indicates drying &/or storage issue; tough Texture points to overly zealous refinement), the high fruit notes in Ritual's Costa Rica 75% seduce with all the sweet charm of a maiden promise. Let's hope future releases flesh it out more.